It's very smelly in the Nautilus room at the Bowers & Wilkins factory – there are no leaky aircon pipes to connect it to the outside world and it's lined with stinky rubbery stuff. But it's where B&W locks golden-eared engineers inside for short periods (very health and safety conscious, you see) to tweak and tune the Nautilus' individually-assembled crossovers. Even 'un-tuned', as I once heard these iconic speakers, gleaming dully in their rubbery gloom, they are ruddy awesome. Of course, for people who cannot afford a 9.1 system of those £55,000-a-pair speakers, it's nice to know that a slice of the clever Nautilus tech has filtered down B&W's range until it can be used in less esoteric products. That's what you have here in the form of B and W's new CM series. Using metal dome tweeters with Nautilus tapering tubes hidden behind them, these CM speakers are aimed above B&W's 600 series and all its 'lifestyle' products, and meant for the discerning cinema freak who wants a slice of B&W quality, but can't afford vapour-deposited Diamond domes and massive bent-wood enclosures that you need two men to heft! 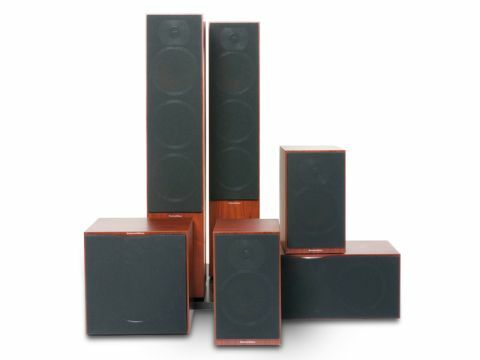 The seven-speaker-strong CM series is also available in glossy black, but I thought these looked good and classic in their handsome rose nutty finish. Add in the square-font branding and they look like they could have been assembled any time since the 1950s. That's until you examine a grille and it pops off in your hand on 21st-century Neodymium magnet grippers. There are corresponding steel bits embedded beneath the surface of the enclosures, and these tiny magnets are now small and powerful enough to work through posh cabinets to hold speaker grilles in place. It all adds a touch of class to proceedings, and as a direct result, the CMs look gorgeous grille-free, because there are no holes ready for the mounts. I, for one, am not mourning mass-market Eelon clips or those even uglier non-precision rubbery grommets used on budget gear. With grilles removed you can feast your eyes on the driver lineup – the aforementioned aluminium dome tweeter, the creamy fixed suspension mid-range driver, and the twin 6.5in paper/Kevlar bass cones below. Then its round the back for a shufti at the dual binding posts on each enclosure. This includes the ASW10CM subwoofer, which has the increasingly wise provision of independent input on both speaker and LFE feed lines, simultaneously. A lot of low-frequency information never makes it to the subwoofer channel, as pro-cinema systems have huge bass drivers all round – unless it's 'Low Frequency Effects' you often miss it due to your satellite speakers' low-end cut off. I had this explained to me very succinctly by Richard Lord, founder of bass behemoth REL Acoustics, and it really does make a huge difference. Since then I have seen this feature appear on a few other subs from different brands. It's annoying if there's no independent control (as with the Tannoy TS1201); good, then, that the B&W ASW10CM subwoofer has a knob for gain control of each. You really can use this feature as a mark of engineering cunning and low-end tonal knowledge in subwoofers. I should warn you that it'll eliminate a lot of them off your shortlist, though. I set the CM9 towers on their big slabby plinths and chose the round plastic feet, rather than spikes, from what I reckon is the best accessory pack in the biz – a card with blister-packed quad-sets of feet and spikes, where everyone else seems to opt for little bags with all the fittings rubbing around inside. With the subwoofer plugged in and the CM Centre 2 and CM5 surrounds in place it was time to go. After all, it's the sound of this luxuriously styled and crafted array that's the real treat. The subwoofer was ludicrously easy to make sound great. A quick play with each of the two gains and a wibble of the crossover – I like it a little below the 80Hz point due to my room's eigentones – and it was singing en masse. In fact, I was blown away by the ASW10CM subwoofer. It's a 10in, 500W design (a 12in model may appear in the future, too) and the bass it produces has that ineffable grip – tight and not at all woolly. Although not to the same scale as the brand's own ASW825 or my own REL Stentor II, it was quite ridiculously fast and satisfying. Indeed, I would say that the superior speed and front-edge attack this whole system is capable of is far above most for the money involved, something I discovered via the demo-worthy opening sequence of Iron Man (Blu-ray). This really has it all: loud rock music that goes from 'background' to 'feature' as the viewer is transported into a HumVee where a small portable is blasting the same tune; a wide soundscape within the vehicle as Stark (Robert Downey Jnr) waxes lyrical; and then the inevitable hell breaking loose, with the coherent wavefront of that first explosion, the savage edge of the mid-distance gunfire that occurs back left, and the RPG that whooshes from rear-left to rear-right behind you. Not to mention every one of the really big blow-you-off-your-feet explosions. The CM series delivered the whole shebang with believable scale and depth. While I was watching the screen, rapt as ever, an audiophile friend was watching my double-glazed double doors bulge. These speakers mean business. But while scale and might are great fun they have little to do with the overall emotional impact. Time, then for the test CD, a 5.1 DTS Sting title, rotting in a 20-year-old Denon CD player. I leave it in there for simple 'on/off, is it working?' checks, but this time I sat and listened to whole tracks again, revelling in the delicious twangy guitars of Love is Stronger than Justice and the lack of any sibilance on the vocals, despite the B&W's metal domes. This system is both sweet and impactful. Placement was pin-sharp, and we were right in Sting's megalomaniacal musical grasp, as all sorts occurred around us in the soundfeld. My mate hated it – he's a real stereophile – but I was amazed by the bizarre levels of value for money the CMs represent. These cabinets are the flappy-paddle gearboxes of the speaker world – mid-price yet with Formula One technology!